Revenue in the Textile & other Footwear segment amounts to US$73,345m in 2019. The market is expected to grow annually by 3.5% (CAGR 2019-2023). In global comparison, most revenue is generated in China (US$41,767m in 2019). In relation to total population figures, per person revenues of US$17.72 are generated in 2019. The market for Textile and other Footwear comprises models that are either not made of leather and/or can not be assigned to athletic footwear. Town footwear with textile, rubber or plastic uppers as well as rubber boots, flip flops and wooden clogs fall into this category. Reading Support Revenue in the Textile & other Footwear segment amounts to US$73,345m in 2019. Reading Support The Textile & other Footwear segment is expected to show a revenue growth of 3.4% in 2020. Reading Support The average revenue per person in the market for Textile & other Footwear amounts to US$17.72 in 2019. Reading Support In the market for Textile & other Footwear, volume is expected to amount to 3,560.62 m prs. by 2023. Reading Support The market for Textile & other Footwear is expected to show a volume growth of -2% in 2020. 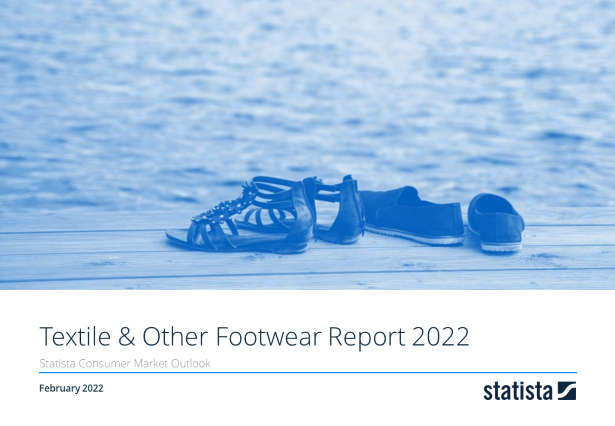 Reading Support The average volume per person in the market for Textile & other Footwear amounts to 0.9 pairs in 2019. Reading Support The average price per unit in the market for Textile & other Footwear amounts to US$19.24 in 2019. Reading Support With a market volume of US$41,767m in 2019, most revenue is generated in China. Here you can find more studies and statistics about "Textile & other Footwear".